Shiro Samurai's Cosplay: If I go to Oulun Animeseminaari..
.. I think I know who to cosplay there! Oulun Animeseminaari is held during 18-19 August and well, because it's in Oulu (read: pretty close to me), has free entrance and I think I might be able to sleep over at a friend's place.. well, why not? I would only need to pay for the train tickets to get there and back. Besides today I checked when my school starts and it seems to be 20th August so mom can't use the "you can't go because you're gonna miss school" card.. and you don't have school during weekends anyway lol, but I know she means if I go there on Friday or/and come back on Monday.. but because it's close I need not take extra days I think. I can't say the manga was bad, but I can't say it was OMFG awesome either, worth a read though and quite funny sometimes. Basically it's like a more light fluffy not-so-serious romantic version of Hakuouki where no one dies, heck, there's hardly any fights. 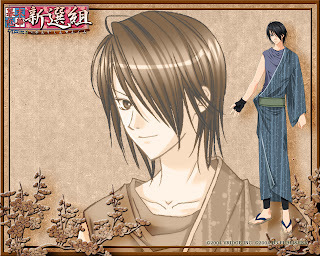 I found it enjoyable and it was quite funny to notice that pretty much all the characters had the exact same personalities like in Hakuouki.. except Kondou who was a womanizer and had a white-pink kimono with flowers on.. and is blonde. lol Didn't see that coming. Whoops, I ended up rambling about Bakumatsu Renka Shinsengumi when I was supposed to reveal my cosplay plans for Oulun Animeseminaari, if I can go there. At least based on the manga Saitou was my favorite, followed by Hijikata. He has pretty much exactly the same personality as in Hakuouki Shinsengumi Kitan, he is the distant lone wolf of the group and hard to read because he doesn't really show emotions.. until he trusts someone. It would be an easy cosplay and it seems pretty comfortable to move around in too, although I will add swords to it. I figured I could maybe use one of my vintage kimonos for him too.. it isn't the right color (although the color and patterns, if any at all, varies from picture to picture...) but it has vertical 'spray'-like pattern.. kinda like he does on that official art photo. 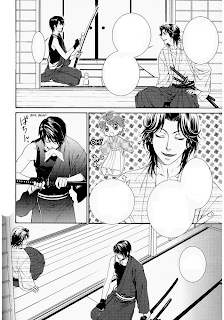 Note how in the manga his kimono is plain. If I decide to use this one I just need to make that purple loose armless shirt whatever-it-is, a glove and an obi.. because his obi is weird pattern-wise and I can't find anything similar to it online... and green kaku obi's are rare anyway. The rest I have at home... oh, and a wig I need to buy. Juu, se on 18-19 päivät tätä kuukautta.